The Choir Girl: It's Symphony Time! 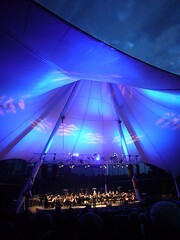 It's one of my favorite times of the year this weekend: it's the Symphony Under the Sky festival! 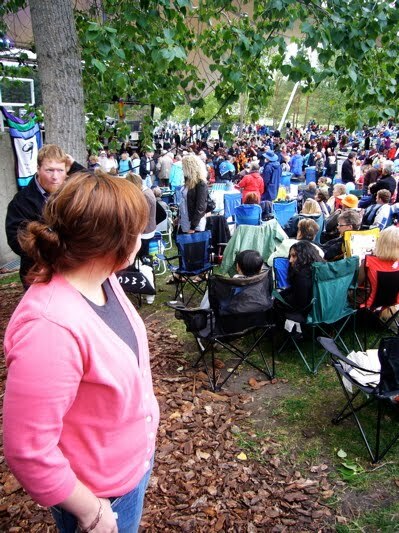 I've been going to this annual event for many years now and there's nothing that can beat the outdoor ambiance of a symphony concert. The lawn chairs come out, you consume salty popcorn, and eat smokies from the hot dog vendor. Delicious times! Oh yes, and the music is excellent as well. The vibe is just so relaxed that it's a great event to come to even if you're not equipped with an arsenal of musical knowledge. Music should just be enjoyed by everybody! You're really attending for the atmosphere and the music plays in integral role in creating that atmosphere. The first night always is a pleasant classical concert. Nothing too intense, just a set list of enjoyable music. On the program for this evening is Prokofiev's Violin Concerto No. 2, Beethoven’s First Symphony, and Brahms' Hungarian Dances No. 5 & 6 (one of my favorites!) and Bach's Sheep May Safely Graze (which will remind me of Christmas since I always hear this song at Christmas). I've always been an avid fan of movie music. Music is essentially another character in a film so it's crucial that it is well constructed and suited to the movie's overall theme. It'll be an evening filled with John Williams' tunes such as Superman, Schindler’s List, Star Wars, and Harry Potter and the Sorcerer’s Stone. I'm looking forward to this evening greatly! I won't be attending this concert but the tunes of Billy Joel and Elton John will be heard throughout the evening. If you do go, you will hear the tunes: Candle in the Wind, Rocket Man, Movin’ Out, Just the Way You Are, Piano Man, and Goodbye Yellow Brick Road with piano and symphonic back-up. Should be a great night, let me know how it is if you go! Ah, my favorite event to go to on Labour Day Monday. The Royal Canadian Artillery will shoot guns in Tchaikovsky’s 1812 Overture during the finale and I will be sure to have my bells/keys ready to shake at the end of the piece as the audience plays a helping role in echoing the victory bells heard throughout Moscow. I'm also interested to hear what other "Canadian hits" I will recognize. Four Strong Winds, Snowbird, Big Yellow Taxi and Heart of Gold are on the program. I know Four Strong Winds but not the other mentioned pieces. I hope to be pleasantly surprised! It's a very exciting line-up they have for the weekend. There are also afternoon concerts on Saturday and Sunday which you can check-out on their website. If you want to learn more, just listen to conductor, Bob Bernhardt, and what he has to say about the festival line-up! Tickets: Available at their box office 780-428-1414 or on their website. 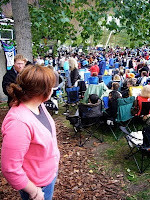 Hope to see you at the festival if you happen to be in Edmonton! I'll also be live tweeting from the event so you can follow me here if you wish! Aww man! I wish I was there, especially for the John Williams one!! Have a blast and a half!! I wish you were here too Shruchi! Miss you!